The notes feature lemon, apple, bergamot, ginger, gardenia, lily of the valley, jasmine, cedar, amber and musk. While my recent cravings all seem to involve orange blossom, my ever roving perfume eye has been making sly glances at ginger lately….but darn that apple in there….I’m afraid that apple is very near raspberry on the “just say no” list. I’m pretty much done with apple too. Apple raises a wary eyebrow with me, but isn’t entirely out of the question. That hideous label, on the other hand… :O And talk about a noncommittal line: “not quite the same nor entirely different”. Thank you, Mr. Obvious. LOL…the ad copy is silly, but I love that label! oooh now I’m feeling rebellious! So I’ll be QUITE THE SAME AND ENTIRELY DIFFERENT….heheheheh…someone hide my coffee pot. Fragrance sounds kinda like it might be lovely… bottle is Hideous and Cheap! Just my Humble opinion. Well, then there are two of us. LOL…looks like I’m the only one who likes it! No Robin, I like it too. The cute label is what made me click to read the copy…not the list of ingredients. Apple is a definite no for me. However, I’d love to have a silk top in the print on the label! 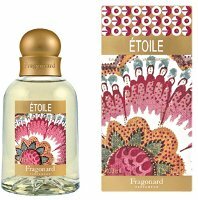 I actually picked this up in France at the Fragonard Perfumuer a few weeks back. I purchased the perfume and not the Eau de Toilette and i love it. At first it smells similar to light blue from DnG but becomes pleasantly fruity and nice. I’ve gotten compliments every time i have worn it.